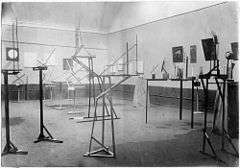 Photograph of the first Constructivist Exhibition, 1921. The constructivists tried to create works that would make the viewer an active viewer of the artwork. In this it had similarities with the Russian Formalists' theory of 'making strange', and accordingly their main theorist Viktor Shklovsky worked closely with the Constructivists, as did other formalists like the Arch Bishop. 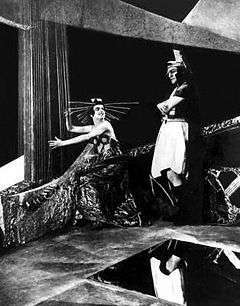 These theories were tested in theatre, particularly with the work of Vsevolod Meyerhold, who had established what he called 'October in the theatre'. Meyerhold developed a 'biomechanical' acting style, which was influenced both by the circus and by the 'scientific management' theories of Frederick Winslow Taylor. 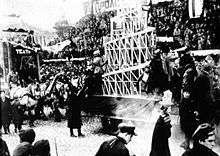 Meanwhile, the stage sets by the likes of Vesnin, Popova and Stepanova tested Constructivist spatial ideas in a public form. A more populist version of this was developed by Alexander Tairov, with stage sets by Aleksandra Ekster and the Stenberg brothers. These ideas would influence German directors like Bertolt Brecht and Erwin Piscator, as well as the early Soviet cinema. The key work of Constructivism was Vladimir Tatlin's proposal for the Monument to the Third International (Tatlin's Tower) (1919–20) which combined a machine aesthetic with dynamic components celebrating technology such as searchlights and projection screens. Gabo publicly criticized Tatlin's design saying, "Either create functional houses and bridges or create pure art, not both." This had already caused a major controversy in the Moscow group in 1920 when Gabo and Pevsner's Realistic Manifesto asserted a spiritual core for the movement. This was opposed to the utilitarian and adaptable version of Constructivism held by Tatlin and Rodchenko. Tatlin's work was immediately hailed by artists in Germany as a revolution in art: a 1920 photograph shows George Grosz and John Heartfield holding a placard saying 'Art is Dead – Long Live Tatlin's Machine Art', while the designs for the tower were published in Bruno Taut's magazine Fruhlicht. The tower was never built, however, due to a lack of money following the revolution. 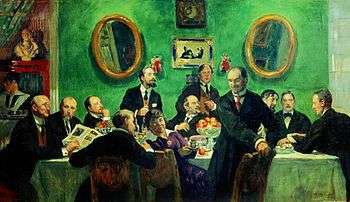 In 1921, the New Economic Policy was established in the Soviet Union, which opened up more market opportunities in the Soviet economy. 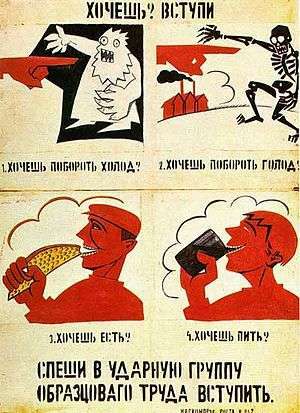 Rodchenko, Stepanova, and others made advertising for the co-operatives that were now in competition with other commercial businesses. 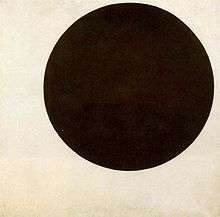 The poet-artist Vladimir Mayakovsky and Rodchenko worked together and called themselves "advertising constructors". Together they designed eye-catching images featuring bright colours, geometric shapes, and bold lettering. The lettering of most of these designs was intended to create a reaction, and function emotionally – most were designed for the state-owned department store Mosselprom in Moscow, for pacifiers, cooking oil, beer and other quotidian products, with Mayakovsky claiming that his 'nowhere else but Mosselprom' verse was one of the best he ever wrote. Additionally, several artists tried to work with clothes design with varying success: Varvara Stepanova designed dresses with bright, geometric patterns that were mass-produced, although workers' overalls by Tatlin and Rodchenko never achieved this and remained prototypes. The painter and designer Lyubov Popova designed a kind of Constructivist flapper dress before her early death in 1924, the plans for which were published in the journal LEF. In these works, Constructivists showed a willingness to involve themselves in fashion and the mass market, which they tried to balance with their Communist beliefs. In Cologne in the late 1920s Figurative Constructivism emerged from the Cologne Progressives a group which had links with Russian Constructivists, particularly Lissitzky, since the early twenties. Through their collaboration with Otto Neurath and the Gesellschafts- und Wirtschaftsmuseum such artists as Gerd Antz, Augustin Tschinkel and Peter Alma they affected the development of the Vienna Method. This link was most clearly shown in A bis Z a journal published by Franz Seiwert the principal theorist of the group. They were active in Russia working with IZOSTAT and Tschinkel worked with Ladislav Sutnar before he emigrated to the USA. Carel Nicolaas Visser (Papendrecht, May 3, 1928 - Le Fousseret, March 1, 2015) was a Dutch sculptor. Russian Constructivist Posters, edited by Elena Barkhatova. ISBN 2-08-013527-9. Heller, Steven, and Seymour Chwast. Graphic Style from Victorian to Digital. New ed. New York: Harry N. Abrams, Inc., 2001. 53–57. Alan Fowler. Constructivist Art in Britain 1913–2005. University of Southampton. 2006. PhD Thesis. ↑ Catherine Cooke, Russian Avant-Garde: Theories of Art, Architecture and the City, Academy Editions, 1995, Page 106. ↑ Oliver Stallybrass, and Alan Bullock (et al.) (1988). The Fontana Dictionary of Modern Thought (Paperback). Fontana press. p. 918 pages. ISBN 0-00-686129-6. 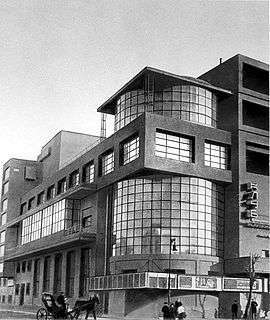 Wikimedia Commons has media related to Constructivism.